Contents: Includes: Analyzer with on-board printer, power supply cable, operating manual, cleaning kit and optical test cartridge. The DCA Vantage Analyzer is a point-of-care CLIA-Waived immunoassay analyzer for diabetes management. The DCA Vantage Analyzer provides you with in-house Albumin, Creatinine, and A:C Ratio testing with lab-quality sensitivity and specificity. Only a small sample size is needed 1uL for HbA1c testing. (Includes: 1 analyzer, power cord, built-in-printer, user guide and software) FDA-Cleared and CLIA Waived. 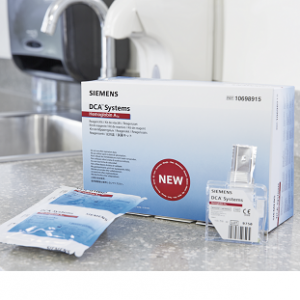 The Siemens DCA Vantage Analyzer leverages robust technology and delivers the proven performance of the DCA HbA1c and DCA Microalbumin/Creatinine tests and Albumin-to-Creatining (A:C) ratio results. Simple enough to use in your office or clinic, and yet powerful enough to deliver lab-quality performance at the point-of-care. • Manage diabetes patients more effectively. • Improve workflow in office or clinic. • Simplify management of diabetes testing in decentralized settings. 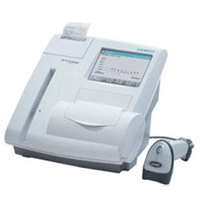 • One of just two HbA1c analyzers that meets tightened NGSP performance criteria. 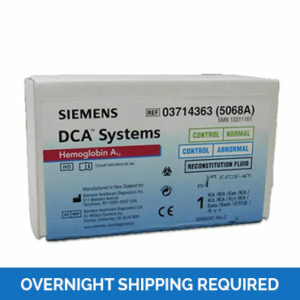 • Used by three out of four physicians who perform HbA1c testing in their offices. • System includes: Analyzer with on-board printer, power supply cable, operating manual, cleaning kit and optical test cartridge.